Organized by the Getty Museum in conjunction with the Gallerie degli Uffizi in Florence and the Morgan Library and Museum in New York, “Pontormo: Miraculous Encounters” is curated by Getty Museum Senior Curator of Paintings, Davide Gasparotto and Bruce Edelstein, coordinator of graduate programs and advanced research at NYU Florence. The paintings and drawings presented in the exhibition were created by Jacopo Pontormo between 1528 and 1530, during an intense historical period. Battles between Florentine Republican forces and the Medici family in 1527 resulted in a siege. Incredibly, all three Pontormo paintings in the exhibit were painted during this tumultuous time, when Mannerist painter Jacopo Pontormo bravely remained in Florence to guard his home. The opportunity to see the Visitation is somewhat of a miracle, not only because it’s the first time this riveting painting has left Italy, but more importantly because it was considered, according to Getty Director Timothy Potts “lost to the world,” until it was discovered within the last century. The theme of the exhibit, “Miraculous Encounters” not only alludes to the miraculous meeting between the pregnant Virgin Mary and Saint Elizabeth in the “Visitation,” it also refers to a dialogue between drawings and painting by Pontormo and his pupil Bronzino. Pontormo’s Visitation utterly captivates, holding the viewer spellbound with its expressionistic color and serenely moving subject. More than six feet tall, the painting depicts Mary’s meeting with her cousin, Saint Elizabeth, when both were pregnant. As patrician women, they are both accompanied by female attendants of the same age. When observing the painting, compare and contrast the rigidity of the architecture and the stoic mien of the female attendants with the dynamic, electric fluidity of Mary and Elizabeth. Vibrant flowing robes conceal epic, Biblical heroes waiting to be born: Jesus Christ and John the Baptist. Despite cloudy skies overheard warning of impending tempests, the strength of Mary and Elizabeth’s gaze is firm and unbroken. Similarly, by prolifically painting masterpieces during a historic siege, when the walls of his own city were being destroyed, the painter Pontormo himself embodied resilience. Cultural Cocktail Hour Trivia: Did you you know that the painting was commissioned by Bartollomeo Pinadori, a merchant of art supplies, particularly pigments? This explains why, even for a painting of its time, the colors are exceptionally resplendent. Who are the two mysterious tiny figures at the bottom left of the panel? Bruce Edelstein suggests that they are Zacharias and Joseph, the husbands of Elizabeth and Mary. Edelstein also revealed that Michelangelo saw Pontormo as his successor; Pontormo was considered the greatest living painter in Florence. Indeed, the rich orange hued folds of Elizabeth’s robe evokes Michelangelo’s Delphic Sibyl in the Sistine Chapel. Dr. Gasparotto called the Portrait of a Halberdier a “glory” of the Getty’s permanent collection. When observing the painting, note the medallion in this young man’s cap. The medallion contains the image of Heracles, a symbol of Florence. Just as the statue of David symbolized the power of the Florentines to vanquish powerful adversaries, Heracles also epitomized the intrepid spirit of the Florentines during this epoch of military strife. Another aspect to note is the uncanny similarity between face of the Halberdier and the face of one of the female attendants in the Visitation. Pontormo’s painting depicts Carlo Neroni, a volunteer in the army for the Florentine Republic. In his hands, this serious young man holds a letter. What does the letter represent? Is it a love letter? Is it a secret political letter? The only clue that we have are the few letters visible on the letter “Dom”- which could refer to a lord or to a house. Yet another file for the Art Mysteries! One cannot enter a gallery, museum, or even concert venue without encountering a selfie taker, some more subtle and thoughtful than others. Taking a selfie as a souvenir of an artistic experience is one thing. But what happens when I-phones become Weapons of Mass Destruction? Unfortunately, at the 14th Factory, a pop-up gallery in Los Angeles, a clumsy student taking a selfie apparently caused more than $200,000 worth of damage to a series of crowned pedestals by Hong Kong based multimedia artist Simon Birch. 2) it was an accident. An article in this week’s New York Times about the Birch incident reveals that this is only one of many episodes around the world of selfies causing artistic destruction. Even the powerful, mythical Hercules has been crushed by a selfie; in 2015, a 300 hundred- year-old statue depicting the demigod was damaged by two eager selfie takers in Cremona, Italy. A thoughtless selfie taker in Lisbon caused a statue of a 16th- century Portuguese king, Dom Sebastiao, to topple over and shatter. Other news outlets report that the 19th Century Greek sculpture “Drunken Satyr” was damaged by a selfie taker in Milan who thought it was a good idea to jump into the statue’s lap. Unfortunately, the sculpture lost a leg. At what point does an individual’s quest for a selfie take precedence over the artistic experience of those around them? There can be no doubt that we currently live in a solipsistic society. The most popular gadgets begin with the self-serving pronoun “I”: I-phone, I-pad, I-Tunes. Me. Me. Me. Even if we were to ignore the damage to the artworks or the irritating distraction to those around them, how meaningful of an experience can an individual have with a work of art if his eyes and fingers are consumed by his I-phone? And by soul, I don’t think that Ruskin meant Siri. In his Book of Musical Anecdotes, Norman Lebrecht relates a revealing incident from Verdi’s childhood. The seven-year-old Verdi, born into a modest family, once served as an altar boy at the church of Le Rencole. During Fête Day, the young boy heard the organ for the first time. Transported by the emanating musical harmonies, the child did not hear the priest’s request for water. Three times did the priest make his demand, to no avail. Enraged at the child with his head in the clouds, the priest struck a severe blow, pushing young Verdi down the three altar stairs, knocking him into unconsciousness. When the child thankfully awoke from his ordeal, what was the first thing for which he asked his parents? A painkiller? A glass of water? A restraining order on the belligerent priest? Young Verdi asked for music lessons. Angelenos have a chance to preview works from the estate of Lila and Herman Shickman, in advance of an Old Master sale in New York in May. A prominent art dealer of the 20th century, Herman Shickman fled Nazi Germany and moved to New York where he dealt Old Master works on paper and still life paintings. Until he retired in 2003, Shickman ran his eponymous gallery on New York’s Upper East Side. Juan van der Hamen y León’s Still Life with Flowers and Fruit is expected become the most expensive Spanish still life ever auctioned. Sunday, January 13, 2019 1 P.M. The Metropolitan Opera National Council Auditions is a program designed to discover promising young opera singers and assist in the development of their careers. 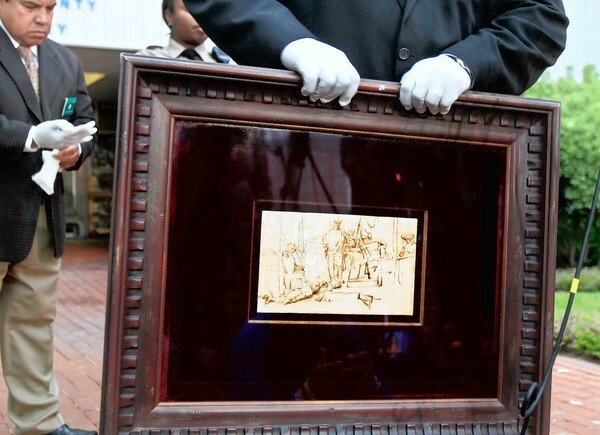 Only three days after a Rembrandt drawing valued at $250,000 was snatched from the Ritz Carlton in Marina Del Rey, “The Judgement,” turned up mysteriously at St. Nicholas of Myra Episcopal Church in Encino. An assistant priest noticed the drawing placed inside his boss’ office. He assumed that it was a donation by a parishioner before recognizing the work as the stolen Rembrandt. Why did the art thief dump the painting in the church? Was it a spiritual crisis of conscience? Or a convenient place without security cameras? Did the title of Rembrandt’s drawing, “The Judgement,” give the thief pause? How did the art thief get access to the church’s inside office? Did he watch Ben Affleck’s heist-caper “The Town” too many times and don a nun disguise? Why did the thief choose to take a Rembrandt from the sailing haven of Marina Del Rey to Encino? He could have made a seaside escape with his looted booty. Is it possible that the art thief is,in fact, a Valley Boy? Thanks to Brian Lauritzen of KUSC for today’s Cultural Trivia! His show revealed that George Gershwin purchased taxi cab horns in Paris to produce the effect of bustling city streets for American in Paris. The taxi horns were used in the New York premiere of the piece at Carnegie Hall in 1928 with the New York Philharmonic. Since then, orchestras have often rented taxi horns to perform the piece. If you listen to it again, you will be sure to hear the unmistakable honk! This weekend’s Cultural Cocktail recipe includes a splash of Zubin Mehta, a dash of Yefim Bronfman , and 2 Oz. of Brahms Enjoy! Former LA Phil director Zubin Mehta returns to conduct the music that started his tenure with the Los Angeles Philharmonic at the age of 24: Brahms! Zubin Mehta Toast at Dorothy Chandler Pavilion Opening Night on December 6, 1964. Educator Gorman Bentley is a natural with children, with an ebullient personality and insights about art history. He patiently explained the concept of a loom and taught my four year-old to complete his own tapestry. With his friendly spirit, Mr. Bentley welcomed all the children sitting at the tables, making each of them feel included and welcome. Following the craft project, Educator Fabrizio Flores took us on a child-friendly the visually arresting new exhibit, “Once Upon a Tapestry: Woven Tales of Helen and Dido.” Flores embodied a perfect balance between playful and informative, showing my son the difference between the cartoon and the tapestries, which happened to be highly informative for me as well! Kudos to the Norton Simon for creating a space for children to reflect and create!